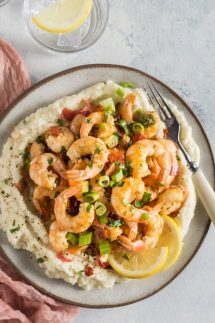 Low Carb Keto Shrimp and Grits just might be my favorite meal EVER! I mean, a low carb remake of a classic that tastes fabulous and, dare I say it, even better than the original? 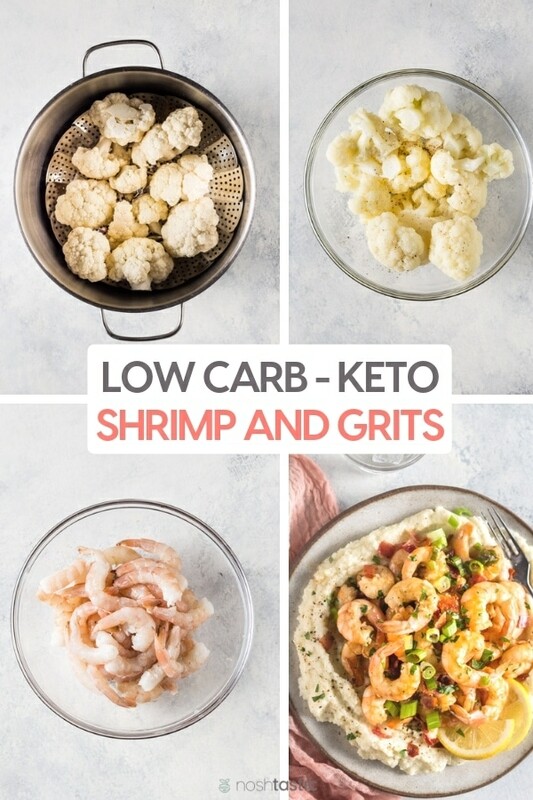 This Keto recipe is quick and easy to make, the ‘grits’ in this instance are made from Cauliflower and the whole meal comes in at around 5g net carbs per serving which is great! My kids really loved it, none of the usual complaints about cauliflower, lol, but what’s not to love when it’s loaded with cheese, right?! First, start by prepping everything before you start cooking anything. Cut up the cauliflower into a couple large chunks, doesn’t really matter what size as you’re going to blend it all up with some delicious cheese anyway, but it makes it easier to deal with. To prepare the shrimp, simply peel the shells off and remove the tails if you prefer. The tails on shrimp look nice if you’re serving them to dinner guests, but they are a little bit of a pain if you’re feeding the hungry masses who have no patience for fancy looking food. I like to use a steamer basket to cook my cauliflower rather than boil it in water, you want it as dry as possible to make the ‘grits’ because if it’s overly wet then your cauliflower grits will be soggy. In another pan get the bacon on to cook while the cauliflower is steaming, then when it cools a bit you can break it or cut it into pieces. 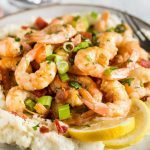 Keep the bacon fat, you’re going to be cooking the shrimp in it. While the cauliflower is cooking grate the cheese, I prefer to grate a block of cheese rather than use the ready shredded variety. I used white cheddar this time, but any cheddar will do. Add butter, cheese, salt and pepper to the hot cauliflower (drain the water out) and using a hand blender, puree it until smooth. Put a lid on the pan and keep it warm while you cook the shrimp. Now heat up the skillet with the bacon grease and cook the shrimp for 3 minutes or until almost pink, stirring occasionally. Next, Add the lemon juice, butter, gluten free Worcestershire sauce, garlic, green onions, bacon, and cook for a few more minutes until shrimp is fully cooked. 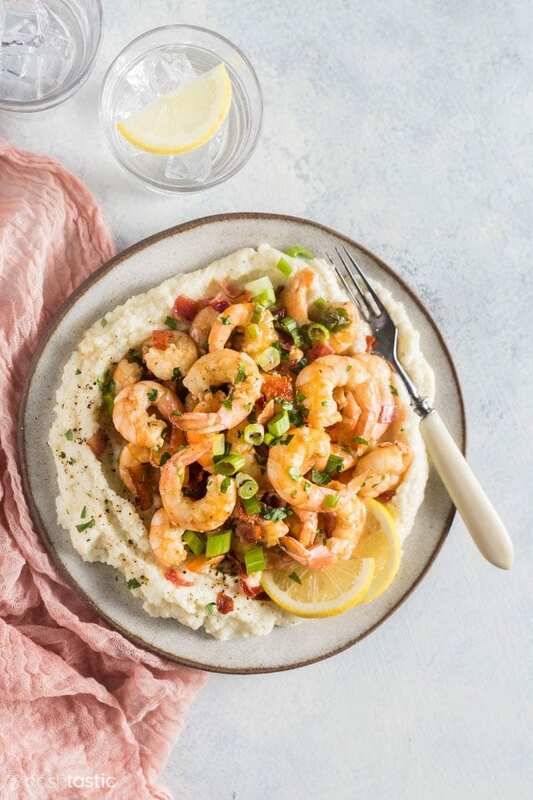 Serve the shrimp over the top of the cauliflower grits and with a little fresh parsley or a few more green onions. 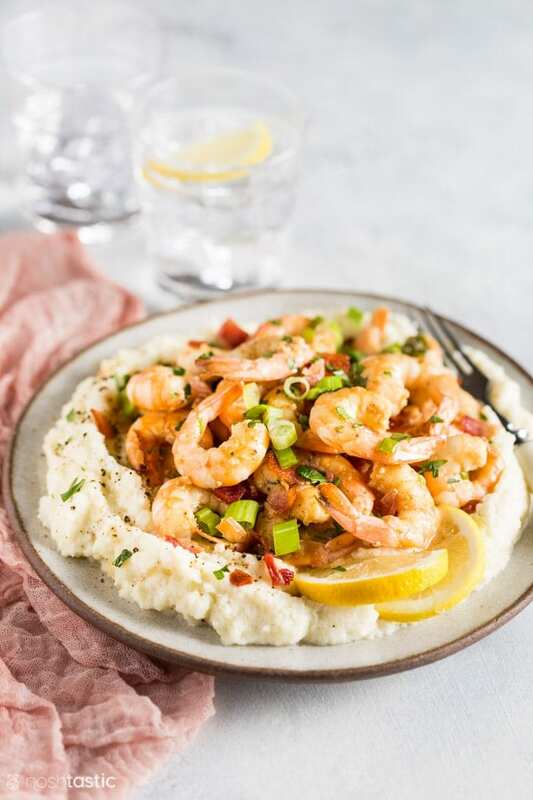 My Keto Shrimp and Grits recipe is just PERFECTION on a plate, it doesn't get any better than this!! With cheesy, yummy, grain free 'grits' you'll be coming back for more!! Cut the cauliflower into chunks and steam for 5-7 minutes until soft, do not overcook. Grate the cheese while the cauliflower is cooking. Drain out any water from the cauliflower and while hot add 2 tbsp butter, shredded cheese, salt and pepper, and blend until smooth. I used a hand blender. Taste and add more cheese, salt, and pepper if desired. Cook bacon in a large nonstick skillet over medium-high heat until crisp; remove bacon from pan (keep the bacon grease) and chop into small pieces. Cook shrimp in same pan with the bacon grease over medium heat for 3 minutes or until almost pink, turn shrimp at least once. Add fresh lemon juice, 2 tbsp butter, Worcestershire sauce, garlic, green onions, and cooked bacon, cook for a couple more minutes until shrimp is fully cooked. Spoon cauliflower grits onto a plate; top with shrimp mixture and a little chopped fresh parsley. Serve immediately. Fantastic! Easy and delicious! Next time I’ll make a little more of the shrimp sauce because we loved it as a “gravy” on the grits!